Don’t Be Unfulfilled — Get Your Copy Today! There is a divine spark at the core of our being and it is Playful - and a Playful life is a joyful life. What you will glean from these pages is how to allow your innate Playful essence express itself in every moment. So think of my life story as a spontaneous tour and initiation into a life of Play. This book is filled with stories of the unexpected, the unique and unusual circumstances that characterize a life of Play. This is not a book about playing - it is a Playful book. The kind of Play I refer to (Play with a capital “P”) is certainly not the play of the idle rich. Nor is it limited to throwing a Frisbee around on a fine summer day. A child is incapable of the kind of Play I am describing, for children know nothing of time or consequences. There is a BIG difference between the Play of a sage and that of a two-year-old. It is the difference between being childlike and childish. So you see, the kind of Play I am trying to describe and encourage can only be expressed by a mature adult who can appreciate and embody the Playfulness of the universe in its many expressions of synchronicities, paradox, humor and being “in the zone.” And most importantly, if there is an absence of the spontaneity, creativity and mystery that generates these qualities, there is no real Play in my opinion. 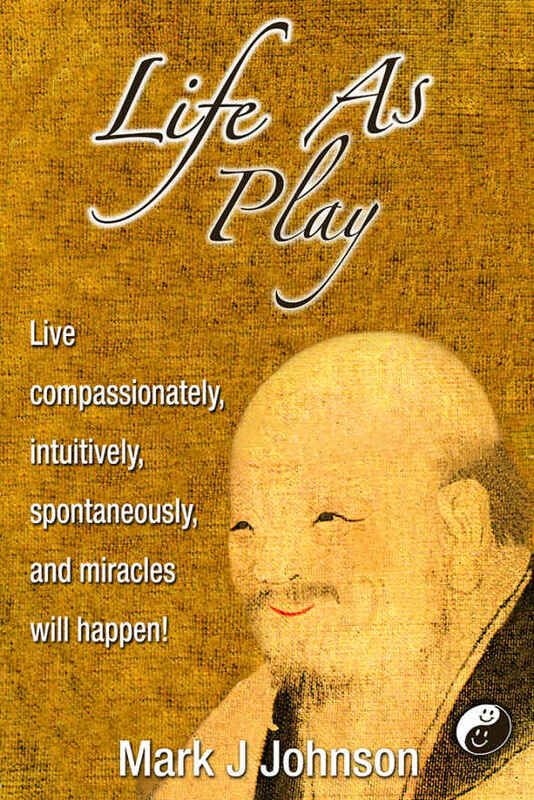 I emphasized those three aspects of Play in particular because they are most often absent in people who are trying to be spiritual or trying to appear spiritual to themselves and others. Especially mystery - if a person has no sense of mystery about them then they are still working at being spiritual. Are all those qualities present in your life? When they are, you will find that even filling out your income tax can be Playful. You can relax and Play with paradox, confusion, chaos, and you can even accept pain and death without losing your sense of lightness and wholeness. This is not to say that life flows effortlessly for people who can truly Play. They have challenges just like everyone else except they are not as bothered by adverse circumstances as other people because they are not so strongly attached to their egos. The size of your ego is not the problem. What’s important is how strongly you are attached to it. It is often more difficult to transcend and include a small, self restricted life than a more expansive, complex one. it can be Play even as it is being challenged. Play is also a perspective, and perspectives create our world. Years ago, eclipses of the sun caused mass panic. Today, people go out of their way to view them—same phenomena, different perspectives, different reactions. The way we respond to things largely determines the quality of our lives so imagine how our lives would be enhanced if we were in a constant state of Play. My scientific friends assure me that healthy growth and creativity most easily happen when one is Playing. They point out how many of the great creative corporations around the world are now featuring game playing stations, small basketball hoops at every desk and ping pong tables in the rec rooms.They also insist that playing is a fundamental survival instinct and is a necessary ingredient in maintaining the neuroplasticity of our brains. Play also partakes of the instant-by-instant delight of pure being. A Playful person can be dancing one minute then sitting quietly the next - and both expressions can be Playful. This level of Play only occurs when you are participating in the co-creation of the universe. In that state, every action becomes an effortless, natural response to circumstances. Within that state, there arises the realization that everyone and everything IS oneself and that everything one does is done TO oneself. When that realization becomes an abiding state, you are expressing yourself from the depths of your being. is the origin and foundation of love, compassion and Play. The connection between Play and the Divine first occurred to me while I was reading the 2,000-year-old Hindu epic, The Mahabharata. That poem refers to the manifest world as the “Lila” or Play of the Lord and asserts that we in our essence are divine and therefore Playful. If the core of our being is divine and if the Divine is constantly Playing - then why aren’t we? It was then I realized this world is not a cosmic mistake, nor is it a veil of tears to be endured and transcended as soon as possible - it is a divine Playground to be enjoyed. So I set out to find others who embodied this idea and who could teach me how to live it. To my disappointment, the people I encountered were mostly busy trying to overcome the circumstances of their everyday lives and trying to squash their egos in order to become “spiritual.” However, there were some who clearly showed they had transcended their egos. They were able to do it without denying the ego, or trying to crush it. Very few people completely succeed but they do exist and it is my pleasure to introduce you to the ones I have known. Finding and living with people who manifest divine qualities was always a priority for me and this book is filled with the lessons I learned from each of them. Seeking the counsel and friendship of those you deem wise and who are also truly loving is a great way to live. To read about the lives of the Buddha, Lao Tzu, Moses, Jesus, Muhammad, Zoroaster, Milarepa, the Holy Mother, Ramana Maharshi, Gandhi, Mother Teresa, etc., is inspiring in itself, but to have lived with such people and cultivated oneself under their tutelage is quite another matter. How would you feel if you had lived in Jerusalem at the time of Jesus and never met him? What a tragedy it would have been to have known the Buddha personally but, due to religious prejudice or tunnel vision, you remained closed to his message of compassion. My mentors are the treasures of my life for it was they who showed me how to Play. My present, Playful life, was nurtured by their attention, endless patience, and a lot of love over a long period of time. Everything of value in this book came through them. So within these pages, you will share in my mystical experiences as a child in the mid-forties, and my teenage years in the hills of Pennsylvania in the fifties. My psychic and spiritual training started with my Hindu teachers in a Florida ashram in the sixties. I then recount my move to California where I meditated with a famous Buddhist master at the Tassajara Zen Center in 1971. I eventually ended up studying at the Taoist Center in Los Angeles for over three years. All that pales in comparison to my 20 years of intense self-cultivation with a powerful Chinese Daoist sage in the seventies and eighties (Who prefers to remain anonymous). That era includes meeting my Teacher in Taiwan in 1974 and the remarkable circumstances of bringing him to the United States. There I studied with him at his center in the “wild and dangerous” hills of Malibu, California for over eight years. I studied tai ji (tai chi), chi gung, acupuncture, Daoist exorcism, spiritual sexual practices and how to integrate our three energetic bodies: the physical, the bioelectrical and the auric body. That 20 year era also includes my learning to Play while teaching in various cities. I taught all of the above all over the country which also included Ken Wilber’s integral theories. Although Ken personally had little to do with Daoism, I have always regarded him as one of the great integral geniuses of our time. I then moved to Tulsa Oklahoma to teach Tai Ji to Frances Ford Coppola and all the famous contemporary actors and actresses who were with him at the making of the movie The Outsiders (which turned out to be just about everyone who is now a mega-star). I finally ended up in Taos New Mexico to enjoy an early retirement at age 40, but after a mere three years, I ended up in New York city again where I got into some really weird stuff - like marriage and raising a family! Needless to say, I evolved spiritually much faster because of that stupid decision than with all the training and teaching I had gone through previously. After a seven year marriage we divorced and then I really did semi-retire to northern California where I get my transcendence through ultralight flying! \I conclude the book with chapters that explore thoughts and observations about why humans, nature, enlightenment, and even death are overrated and why reincarnation is definitely underrated. I also insert a chapter discussing the greatest challenges humanity today and end with a short chapter on the nine precepts of Play. So, what you will discover in this book is this: if an ordinary person like myself can Play in every instant, then surely you can too. I am hoping you will recognize this Playful place within yourself and allow it to expand. To the extent my life has gone beyond the norm, I hope it inspires you to take the plunge into the unknown in your own life. So now, join the cosmic court jester and universal trickster as I meander my way through a life of Play. Let the mystery, magic and miracles begin! Join Mark on his forty-year spiritual odyssey with some of the most fascinating spiritual teachers of the last half-century. His travels take him from the mountains of Pennsylvania to exotic temples in China and eventually to the wild and dangerous hills of Malibu California. Mark chronicles his ten-year training in an ashram in Florida, his year with a famous Zen Roshi in California and his intense, eight year apprenticeship to a powerful Daoist Wizard from China. Written from the perspective of a self-proclaimed enlightened being, who insists that enlightenment and nature are both overrated.